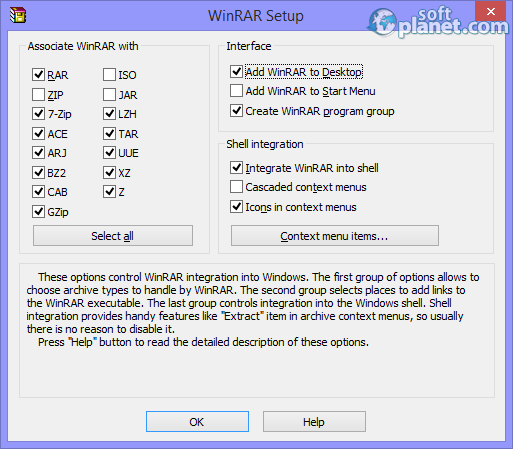 SoftPlanet makes it possible for everyone to get free WinRAR download directly from our servers. There is no registration needed for downloading. WinRAR 5.31.0 is a very well-known compression program, whose first version was released back in 1995. With it you can do many things related to archiving of information. The methods used for the data compression allow large files to be shrunk to the possible minimum. WinRAR is an archive manager which can be used to create new, manage existing and extract already made archive files in many popular formats. 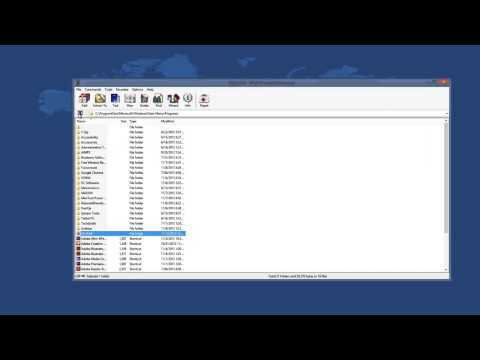 Just freely download whichever file you need in a compressed format and WinRAR will decompress it for you in seconds. WinRAR can be used with Windows, Mac OS, Linux x64 and FreeBSD. The latest program releases including this one are compatible with 32-bit and 64-bit operating system versions and are translated into more than 20 popular languages. The latest version 5.0 has some minor bug fixes and improvements. Besides its own RAR type, WinRAR can also compress RAR, RAR5 and ZIP and decompress ZIP, CAB, ARJ, LZH, TAR, ACE, GZ, ISO, 7z etc. Also self extracted and multi-volume archives can be created within seconds. Any given file, during its creation, can be password protected to increase the security of your information. Best of all – you can incorporate a lot of useful program commands into the Windows shell and bring them out from the mouse context menu. 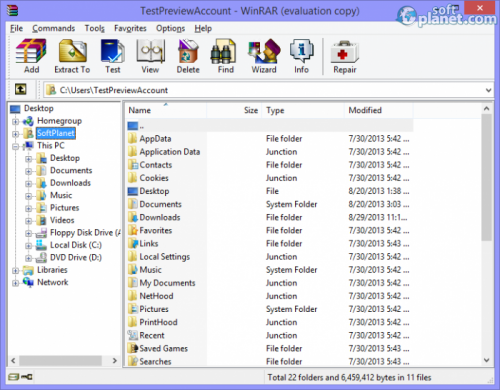 The WinRAR 5.31.0 trial version has 40 days for free evaluation after which you have to buy your license. Believe it or not but the program's interface has not changed a lot during the years. The standard for all Windows-based programs menus and icons are placed on the top of the screen. The address bar is underneath. Further down if you want, you can display the folder tree on the left side of the window. The status bar takes the very bottom line of the screen and contains information about the total number of the files and the total size. There is an option to use different themes, but they have to be downloaded in addition. With WinRAR nothing is impossible. There are two general ways you can use the program's features. 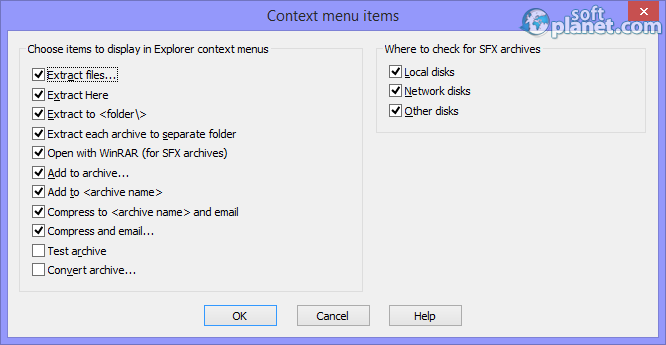 The first is through the Windows context menu. This menu shows only if a single or more files are selected. Users can choose from the options available there and even add or remove some of them from the Settings panel. The other, the standard way, is to open the program's interface, go to the folder which contain the files you want to work with. Make the selection first and then click on Add or Extract To. Then specify some or none of the options from the populated windows and click the OK button. The Add function has six tabs where tons of useful options can be selected. The Extract To has only two tabs but either one function settings can be saved for the future. WinRAR can help you to send many and/or large files as attachments. Self-extracting or volume archives are not a problem at all. Many generations of computer users have used, are using and will use WinRAR because it is simply the best. We friendly suggest this top of the line product to you and can guarantee that you will never be disappointed while using it. So give it a try and then share your experience with it. Our security scan shows that WinRAR is clean from viruses. The current version of WinRAR has been scanned by our system, which contains 46 different anti-virus algorithms. That ensures that WinRAR 5.31.0 is 100% safe for your computer.